Last year I dug up all my bulbs and decided to start over. We bought an old house and some of the bulbs were just overcrowded or not where I wanted them to be. I want more spring flowers this year so I’m starting from scratch. Fall is the time to plant bulbs SO I’ve taken the time to sit down and plan what I want my flower beds to look like come springtime. The first thing you want to do is think about color scheme. Everything you already know about color schemes from art, interior design etc. will apply here too. The simplest is to choose a color and then choose tints and tones of that color. For example, if you choose pink and white then you can stick to bulbs that produce different variations of pink and white in different heights and textures. You can also pick contrasting colors to grow alongside each other which can be stunning as well. What you choose is all based on personal preference. Unlike interiors, gardens are ever changing. The color scheme of your landscape can change every few months as different things come into bloom and then fade. So as you are choosing your colors pay attention to when things will be blooming. The wonderful thing about that is your front yard could start out early spring with purples and then move to yellows and oranges as different things bloom. When I moved in I noticed that my backyard already has a late spring blooming lilac bush, some really early fuchsia peonies, white lilies and a whole carpet of blue forget me nots. The general theme of my backyard in early spring is variations of blue and purple. As such I decided to do a mass planting of basic purple tulips in one bed that will come back year after year along with the other purple toned perennials surrounding it. Take a look at what YOU already have. Do you have an early yellow forsythia by one of your flower beds? Then maybe choose a yellow and orange color scheme. My front yard has a red quince that will bloom in early spring so I’ve chosen pinks, apricots and reds for my front beds. The lucky thing with flowers is that they’re usually lovely no matter what. A mixed bag of whatever can still turn out beautiful if you’re looking for minimal effort. BUT if you want to do something special then start with what you have and go from there. Read packaging and plan for how big things will get. If you’re putting in peonies then make sure there is enough space for them down the road. 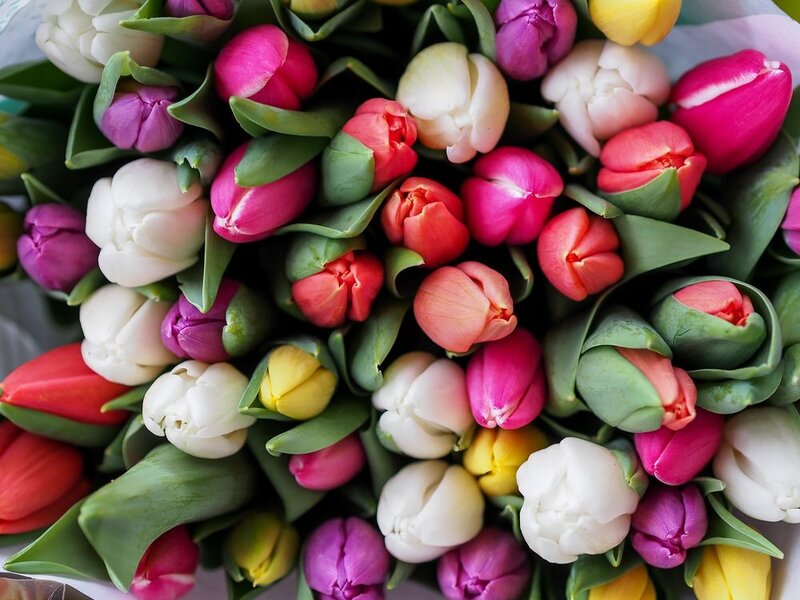 Make sure you don’t have little mascaris crowded out by large closely spaced tulips. Stand in front of your beds and visualize where things will go based on their height and how much space they need. Bulbs can be packed in close or they can be farther apart. It depends on what you’re growing them for. If you are going for a longterm outdoor display then 6-8 inches apart is best. You can also do little bunches of bulbs or you can plant them en masse. The possibilities are endless. If your bulbs are going in for a long time then make sure you give them a happy home. Put in nice compost and flower fertilizer so that they get a good start on life. Just get it at any bigger grocery store if you need to. It’s not rocket science. I used to be so intimidated by soil amendment that I just wouldn’t do it all together. That’s a mistake cause it will make a huge difference. Truly though, planting bulbs is not that complex. If you don’t have much time just buy a pack at most any store and throw them in the ground in October. They can be a little tiresome to plant but every spring you will be so happy that you made a little effort. For me, it’s one of life’s wonders to see those little green shoots coming through the dark earth every spring. Our first year of marriage, I MADE my husband, Mitchell, go out and plant some tulips and daffodils with me in front of our duplex. There we were on a busy road, down in the ditch that ran in front of our house trying to crack open the rock hard soil to tuck some tulip bulbs in. He was laughing at how ridiculous we looked and tedious this was! We’ve since sold the property BUT every spring, as faithful as sliced bread, I see our beautiful little tulips and daffodils happily nodding their little heads to all the passerbyers speeding by. And it’s amazing how if you just make even a little extra effort and plan your beds they can become even more stunning. Remember your tulips and daffodils are most prolific their first year but I personally think they are still extremely beautiful year after year. Have you had any success with bulbs? Please share with us any tips and tricks of your own in the comments below!